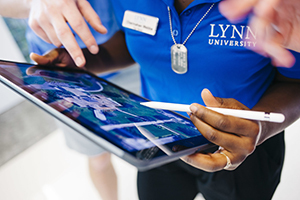 Lynn University in Boca Raton, FL, is upgrading its iPad initiative by providing all undergraduate day students and faculty with an iPad Pro, Apple Pencil and Smart Keyboard. The university launched its iPad program in 2013. Following a pilot project, it provided 750 students, primarily freshmen, with iPad minis in August 2013. Based on the success of the first year, the university then expanded the initiative by providing 1,800 iPad minis to all day undergraduate students, new MBA students and doctoral students in August 2014. "Our introduction of iPad-powered learning in 2013 has supported rises in retention and prospective student inquiries, as well as improved student outcomes," said Kevin Ross, president of Lynn U, in a press release. The university is now upgrading to the iPad Pro, introducing 1,800 of the devices, along with the Apple Pencil and Smart Keyboard, for all undergraduate day students and faculty. The reasons for the switch include improved device performance and support for multitasking. The university also introduced the full-size Smart Keyboard because it "makes it easier for students to draft essays, complete tests and build complex spreadsheets from anywhere," and the "Apple Pencil expands the power of Multi-Touch and supports creative learners by providing them with a new way to capture ideas as notes, sketches or diagrams," according to the university's Web site. The university's iPad initiative has reduced costs for students. They no longer need to purchase a personal computer, and the university has replaced traditional textbooks with custom e-textbooks created by faculty members, "saving students up to 90 percent on core curriculum textbook costs," according to a press release from the university. More information about the iPad program is available on Lynn University's site.